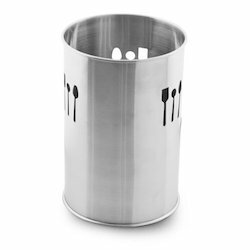 At Shreepal Overseas, we also manufacture and supply an innovative range of stainless steel tableware item like cutlery holder that complement all dining decors. Manufactured by utilizing superior grade stainless steel that provides adequate strength our cutlery holders have smooth finish and bright shine. - This Cutlery Stand/Pan Stand from Sage Koncpt has an elegant design. The Cutlery Stand/Pan Stand can be used to keep pan or cutlery, and can also be used as a key decor item. The Cutlery Stand is made of stainless steel. MI has on offer, a wide assortment of high quality cutlery holders for the domestic market. 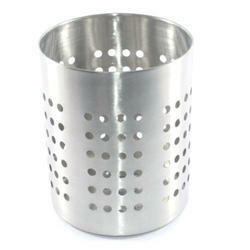 Fabricated using the best stainless steel, our cutlery holders are ornamental, as well as products of great utility. Sold in a wonderful matte finish our cutlery holders are open to customization and come with a promise of good corrosion free life. Our entire range of has exclusive and attractive designs carved upon them. To add to their aesthetic appeal we have used bamboo while fabricating some of our cutlery. Other than these we use aluminum, stainless steel, brass and other materials. Some of the designs carved on them are bubbles, twist and others. Our cutlery holder range adds elegance to fine dining. Stainless Steel Cutlery Spoon Set Of 24 Pcs with Stand. Keeping a deep knowledge about the prevailing desires of our customers, we have been able to give out a rich collection of Stainless Steel Cutlery Holder to our patrons.